In 2006, the National Basketball Association passed what they called the 'Zero Tolerance Policy', which states that once a player is called for a foul, if he protests in a manner deemed too animated by the officiating staff, he can receive a technical foul or be ejected. Rasheed Wallace, a celebrated recipient of the technical foul, responded by saying: 'In my mind, it's kind of like a slave and master'. So a couple days after he says this, I'm in Portland and I go to a Trailblazers game with my wife and her dad. Rasheed is a Trailblazer, and even though he is on the home team, the whole arena erupts in a chorus of boos every time he touches the ball. Late in the game, Rasheed is fouled and sent to the line for two free throws. Suddenly, the arena breaks out in wild applause. I'm confused. There are but seconds left in the game, and the Trailblazers are up by 10 points, 99 - 89. What gives? 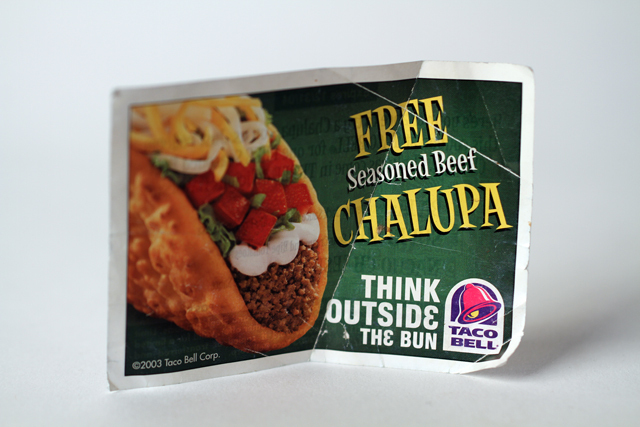 Turns out, if the Blazers score 100 points in a win, everyone gets a free chalupa from Taco Bell. 'Sheed nails one of free throws and we all get free food. Apparently, all it takes to forgive an insulting and egregious overstatement by a man payed millions and millions of dollars to play a game is a chalupa.